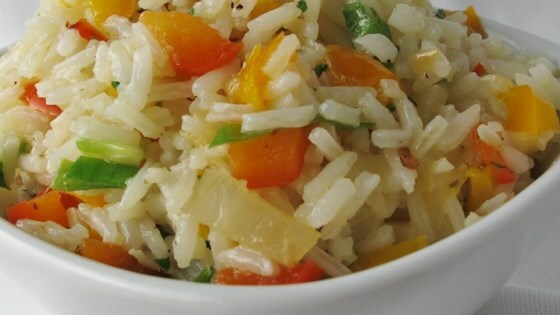 "Normally a pepper and rice dish has a Mexican or Spanish kind of flair to it. I wanted something a little more Italian, and this is what I came up with." Heat oil in a large skillet over medium-high heat. Cook and stir onion in the hot oil until tender, about 3 minutes. Add garlic and continue to cook and stir until onion is translucent, 2 to 3 minutes more. Stir green bell pepper and red bell pepper into onion mixture; cook until tender, about 5 minutes. Season with basil, oregano, black pepper, and salt. Pour wine into vegetable mixture and reduce heat to medium low. Simmer until liquid is reduced, about 5 minutes. Stir rice into vegetables. Top with Parmesan cheese before serving. Agree with other reviewer saying spices were overpowering; and peppers were off sync too. Added butter, and salt to try to salvage, but in the end the flavors just didn't come together for me. pretty tasty :) nice change from spanish rice. I added shedded carrot to mine. cut back on the oregano, maybe add thyme. over all not a bad recipe for using up the white rice from our Chinese take out.